For May Smith, travelling with her husband and baby girl Ellen, stepping foot on the Titanic marks the start of an incredible journey, one which is destined to take her from the back streets of Bolton to the land of opportunity: the United States. But when the 'unsinkable' Titanic hits an iceberg one cold dark night, May's dreams are instantly shattered. Jumping from the sinking ship at the last minute, May loses sight of Joe and Ellen. Distraught, she is pulled into a lifeboat. Minutes later, the real-life Captain Smith swims to the lifeboat and hands May a baby swaddled in blankets. Beside herself, and in virtual darkness, May believes the baby to be Ellen. This rescue is witnessed by fellow survivor, Celeste Parkes, married to an American industrialist who is on her way back to Ohio after her mother's funeral. In horror, they both watch the death throes of the mighty ship; May traumatised, knowing her husband has drowned, Celeste wishing her bully of a husband had been on board and out of her life. As the dawn comes up, and the two women are rescued by the Carpathia,a friendship is formed, one which is destined to transcend the Atlantic and social differences between them and last a lifetime. Then May makes a shocking discovery and a split-second decision which will change the lives of so many. 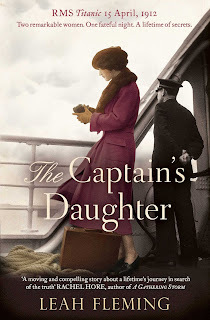 I've always been fascinated by the story of the Titanic so Leah Fleming's The Captain's Daughter made it straight onto my radar and into my virtual shopping basket when it was released by Simon & Schuster in 2012. It has, however, sat on my bookshelf for 4 years so I finally picked it up and, although I did expect an emotional read, it was even more emotional than I ever imagined. May Smith (not related to Captain Smith despite the title of the book), her husband, Joseph, and young daughter, Ellen, are setting off for a new life in America. They have managed to secure a place in steerage on the maiden voyage of the Titanic. On the same voyage, travelling in first class, is Celeste Parkes. Celeste is originally from Lichfield but is married to an American and is returning back to Ohio after attending her mother's funeral. In the early hours of 15 April 1912, the two women find themselves in a lifeboat; Celeste after being given the opportunity to board the lifeboat and May after being fished out of the water, much to the chagrin of the other first class inhabitants of the lifeboat. When somebody resembling Captain Smith hands a baby into the lifeboat, May thinks that she has been reunited with her daughter, but the baby isn't Ellen. When rescued by the Carpathia, May gives the other rescued passengers a chance to claim the baby but when nobody comes forward she has no option but to keep the baby herself. She knows she isn't her baby, Ellen, so in order to not arouse suspicion she calls the baby Ella and returns to England. Meanwhile, Angelo Bartolina is searching for his wife and daughter who were on the Titanic and were coming to join him in New York. He finds a lace shoe on the docks when the Carpathia arrives and he is sure that it belongs to his baby daughter, Alessia. The lace is so intricate it had to have been made by his wife, Maria, but perhaps she sold it or it was stolen on board. Angelo never gives up hope that one day he will be reunited with his daughter. I absolutely adored this book. I was disappointed at first that the Titanic episode was over very quickly in the first few chapters, but the link that May and Celeste formed on the lifeboat was unbreakable, as were my eyes from the page. It's an epic story that spans the period from the Titanic sinking in 1912 to the late 1950's, encapsulating two world wars. 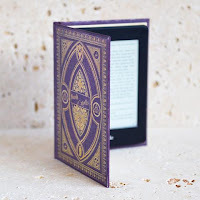 The characters are well rounded, warm and bound together by tragedy; we know their secrets and their fears so it was no surprise that I was in floods of tears at the end of the book. I had shed a few tears part way through and even had a gasp-out-loud moment as the journey came to the end for one of the characters. The Captain's Daughter is an outstanding family saga, written in such a way that you are immediately drawn into the book and embraced by the characters. I heartily recommend this book; it's both emotional and beautiful.